Dear, precious reader, if you’re struggling with fear today, the Lord put it on my heart to write an encouraging word for you. First, if you are struggling with fear, you are not alone. Fear is something the enemy has tried to unleash on many of God’s people. It is a demonic attack. I serve in the intercessory ministry at my church, and when my pastor asks the intercessors to pray with people in the altar, the #1 thing people have come to me asking to receive prayer for is freedom from fear and anxiety. Many of God’s people have been attacked with fear. And I believe that is because we have forgotten what God’s holy antidote to fear is. We try to tell people that faith is the opposite of fear. That if you’ll just have faith, you won’t be afraid. And that’s simply not true. Nowhere in the Bible does it say that faith is the opposite of fear. Faith is the opposite of doubt and unbelief. 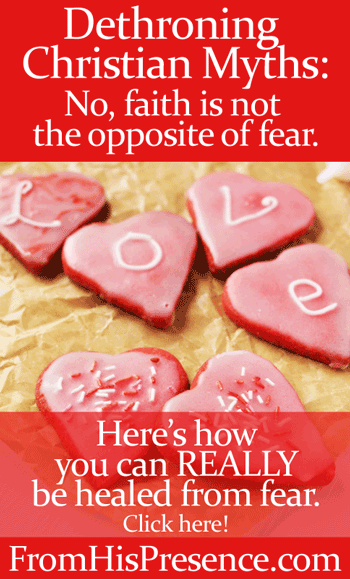 But LOVE is the opposite of fear. Did you get that? That is HUGE. Perfect LOVE casts out fear. In other words, love squeezes fear out. Love fills us up and makes fear leave completely. GOD’S LOVE is the solution you’ve been looking for. See, love acts like a light bulb for your heart. When you go into a dark room in your house, you turn on the light, right? And when you do, suddenly darkness is no more. Darkness has no place, because light has completely filled the room. Darkness can’t even argue. It is just gone. Well, love is the same way. God’s perfect love will completely drive fear out of your heart. I know. I used to be sooooo tormented by fear. I’d have panic attacks so bad I could barely breathe. And it will work the same for you. You can be completely delivered from fear, right now, today. When you start to receive God’s love, God’s perfect love makes all the fear leave. As you receive from your Abba who loves you, His perfect love will cast out all fear from your life. If you’re not sure where to start, I’d encourage you to do the same thing I did, meditating on God’s love by imagining it literally filling you up. There’s power in invoking your holy imagination. When you harness your imagination and yield it to the purposes of God for your life, it opens your spirit and soul to receive God’s best. So if you’re struggling to receive, use your imagination. It will help you. Beloved, there is a God in Heaven who loves you amazingly and perfectly. If you have made Jesus Christ your Lord and the Boss of your life, then Father God has adopted you as His own child. He loves you fiercely and devotedly, better than any human could ever love you. He knows you intimately, and this One who knows you best loves you most. So if you’re struggling with fear today, would you invest the time in yourself to meditate on God’s love? God will deliver you, right now, today. He’ll deliver you from all fear by filling you with His perfect love. Does this message encourage your heart today? If so, please leave a comment below and let me know. Hearing from you makes my day! Thank you!! I find as a pioneer it’s hard not to be afraid all the time as it feels we are always heading on the next adventure and sometimes I just want it to be all worked out right away. But God has been teaching me more and more about His grace also being why we doing need to fear and that He holds the future, and already has it worked out! He does indeed have it all worked out. 🙂 And His heart is beating for you right now. May you sense His affection as you meditate on His wonderful love for you today! I love you Jamie! 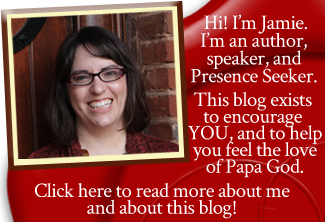 I have been so blessed by your blog! Thank you for all of your hard work.